It’s probably a prototype weapon we didn’t know about. Starting a little early for a Friday, eh? Surely you’d be building camouflaged walls, which you move in front of security trucks which now operator without a driver, because that’s safer for all involved? Sometimes I wonder it’s a good thing I’m not a terrorist. 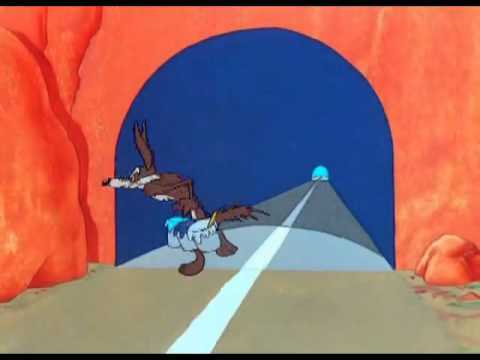 I’m thinking of Wile E. Coyote painting a road tunnel on the face of a cliff. Even if self driving cars make terror attacks easy and the number of people killed from them each year increases significantly, there could still be a very large net reduction in deaths because everyday accidents would be less frequent. But the odd thing about us humans is we tend to care more about HOW people die than how MANY people die. Soo true. 2.4 million for every year, but somehow the way a person dirs changes whether it’s tragic, or relevant. Evil people, devoid of love and the Spirit. Which do you think would be more effective to repel the self drivers, covering your car in red octagons or mirror chrome vinyl wrap so they think they’re about to have a head on collision with themselves? It will be illegal, just like putting an invisible film over your license plate to fool traffic cameras is illegal. It’s not illegal until you get caught. By that standard, high vis clothing should be illegal. Funny enough, that actually might create a problem. Something tells me that there’s no way google could possibly see all the edge cases coming. nothing because they use multiple systems like radar and lidar, not just machine vision. This approach is absolutely necessary when you consider saftey as relying on a single system for navigation would lead to complete failure due to one piece of equipment. Its kind of like how airplanes have multiple failure modes should any one component give out, thus making it possible to land instead of falling out of the sky like a rock. Looks like a turtle-gun to me! So, how do we know it is NOT a rifle inside? So, how do I make it so that automated security systems recognize me as “Head of Security”? What kind of shells does that thing take? This is probably the best demonstration I’ve seen yet that neural network vision systems clearly haven’t copied a real brain. I’m seriously puzzled about what the network IS using to identify the toy turtle as a rifle. The “Cat = guacamole” one is even weirder – clearly the network isn’t using the most obvious feature of guacamole, namely, its greenness. If I had to guess, I’d say it’s mistaking the tortoiseshell pattern for a burr walnut stock and the flippers for magazines. Me thinks that turtle will be stuffed in more ways than one. Just teach the kid to hold the turtle up and yell BANG! Except human vision is *also* trivially easy to fool; that’s the entire point of visual illusions. Human vision and machine vision can be deceived. We live fairly safely by discouraging deception of humans (three card tricksters and poorly maintained traffic lights are discouraged). Should we now also discourage the deception of machine learning algorithms. I for one think that , for non-trivial uses, we should discourage the use of machine learning algorithms that differ too much from our perceptions – it,s not us that are seeing things wrong – it is the AI. The vision subsystem is just a part of our system though. That’s the difference between “AI” and AI – real AI wouldn’t detect the turtle as a gun as it wouldn’t fit the mental model of what a gun would have to look like. IOW pattern matching isn’t intelligence. Reminds me of the time Tesla autopilot mistook the side of a semi truck for empty sky and the driver died. Clearly these algorithms are missing a lot of contextual cues that are obvious to humans. Then we’ll have the first computer to ever say, OH S**T! The AI, from inside it’s box manages to annoy the driver though the “Cry wolf” algorithm until they ignore the actual danger ahead of them. Musk was right all along, but he foolishly thinks he can still stop them. Kind of a counter to all those AI fears, and yes hopes, because it shows at least a little what AI really is, as well as how far it needs to go. I can see the SkyNet HKs (Human Killers) identifying fire hydrants as human and exterminating them. Wht real image recognition will use edge detection grouped into features to make objects based on their order and relative location. Feed thst into even a basic ai and it will get less confused. I have more than once flinched at a leaf or a plastic bag not flat lit a certain way and looking too much like a rock to not ignore. Finally someone who notices none of the PCs have gone dead then stands around the bins listening and finds the culprit. *Just an example, screwing up a bunch of backlight filters into the plastic recycling bin gives loud (Relative to the PCs) creaking, clicks and scrapes as they try to unfurl/unfold. Next from Maybelline – lipstick and mascara that makes facial recognition think you’re Godzilla. His head’s a bit tubular and the legs are at some weird angles too. That’s beside the walnut-effect shell. If you saw this crawling about you’d definitely ring Richard Attenborough. The fact that machine vision is susceptible to optical illusions too isn’t surprising, or even news. It takes in a lot of information, compresses huge amounts of it, to produce one of a small selection of outputs. Of course it’s going to make mistakes. Probably there’ll never be a visual system that doesn’t. In this case they’ve had to go to quite extreme lengths, that’s no ordinary looking turtle. So instead of William Gibson/Bruce Sterling’s shirts that won’t be recorded (“Zero History”), we have patterns that can be reliably fooled into a fake interpretation by machine. That’s not much different than a “human” optical illusion but the real trouble starts when you start basing real physical/medical/legal consequences on faulty algorithms. They might scream ‘Turtle, turtle, turtle,’ over and over and over again. They might put ‘turtle’ in all caps. You might even start to believe that this is a turtle.